A Barry Sanders personal appearance, Barry Sanders speaking engagement, or Barry Sanders endorsement will reflect well on your company. To hire Barry Sanders now for any corporate appearance, fundraiser, motivational speaker event, personal appearance, autograph signing, or website endorsement please contact our celebrity agents at 1-877-6-SPORTS. We will contact Barry Sanders or contact Barry Sanders' agent and provide you with the booking fees and availability immediately upon your request. Direct Sportslink is the only sports speakers bureau and talent booking agency based in the United States securing only sports talent for corporations, associations, and organizations for motivational speaking engagements, personal appearances, and endorsements. We are the premier sports celebrity booking agency and a sports celebrity procurement expert. 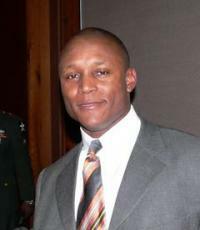 Accordingly, we will provide you with any relevant Barry Sanders website information and booking agent details so that you can hire Barry Sanders for your next event. Sanders lead the nation in rushing yards (2,628), total yards (3,250), touchdowns (39) and scoring (234 points) en route to winning the 1988 Heisman Trophy while playing for Oklahoma State. His rushing yards and touchdowns in that year still stand as NCAA single season records. Rather than try to set more records as a senior, Sanders declared himself eligible for the NFL draft and left OSU as the team's all time leading scorer with 330 points (55 touchdowns). 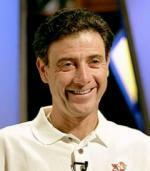 In 2003, Sanders was enshrined in the College Football Hall of Fame. The Detroit Lions selected Barry Sanders third overall with their 1st-round pick in the 1989 draft. Sanders' most productive year came in 1997. Rushing for 2,053 yards, he became only the third player to reach 2,000 yards in a single season. He was the first running back to rush for 1,500 yards in five seasons and the only one to do it four consecutive years. He also set an NFL record by rushing for at least 100 yards in 14 consecutive games. He shared the league's Most Valuable Player with Brett Favre. On July 28, 1999, at the age of 31, Sanders shocked many when he announced his retirement from pro football. He left football healthy and in his prime, having gained 15,269 rushing yards, 2,921 receiving yards, 118 kickoff return yards, and 109 touchdowns (99 rushing and 10 receiving). He retired within a one-season striking distance of Walter Payton's career rushing mark of 16,726 yards. Only Payton and Emmitt Smith, who broke the record in 2002 have rushed for more yards than Sanders. Sanders place in history is a matter of some debate. Many people say he is the greatest running back of all time, arguably one of the greatest players in professional football history, but others say he only has himself to blame for his premature retirement. On August 8, 2004, Sanders became the third youngest player ever inducted into the Pro Football Hall of Fame. Only Gale Sayers (34) and Jim Brown (35) were younger. Based on your interest in Barry Sanders as a speaker or for a personal appearance, Direct Sportslink has provided you additional links below for other sports talent with similar appearance fees, speaker topics, and categories that match Barry Sanders.